Ever tried to bake a flourless chocolate cake? This cake is incredibly rich in chocolate, best for chocolate lovers, including my daughter. Do you know what happened when I baked this cake? When I took out the cake from oven, she couldn’t wait until it completely cooled down. She ate the whole cake almost on her own within two days. Then after two to three weeks, shed asked me to bake another one for her, complaining she hadn’t eaten a chocolate cake for a long time. Huh?! Alright, it’s not hard though. Yesterday, she asked me for the recipe and baked one for herself. Unbelievable! Preheat oven to 170C (335F). 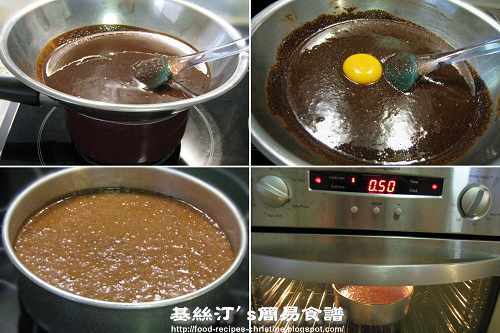 Melt chocolate, butter and sugar in a bowl over a pot of hot water at low-medium heat. After melting all ingredients, remove from heat, stir thoroughly to combine. Beat egg whites with slow-speed electric mixer for 2 minutes. Then turn to high speed and beat until the egg whites become very stiff and peaked. Fold in a few spoons of egg whites into the chocolate mixture to lighten it. Gently fold in the rest with small amount at a time for 3 times just until all ingredients are incorporated. Do not beat. Turn the mixture into a greased and floured 20cm round bakery tin. Bake for 40 to 50 minutes. Insert a needle to test the cake. If the needle comes out clean, it’s cooked through. Remove from the oven and let it cool completely on a wire rack. Dust with icing sugar to serve. 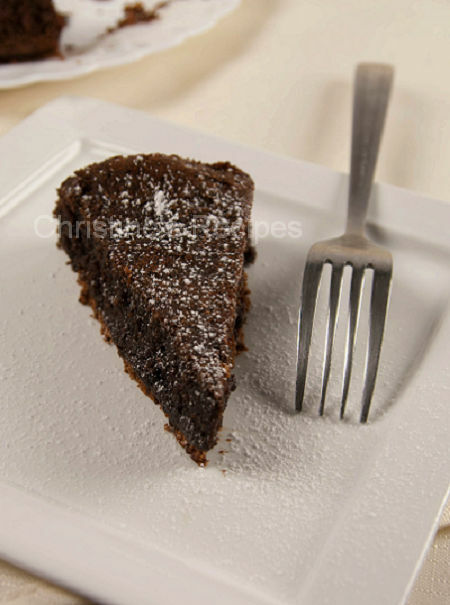 This cake is very moist, with rich chocolate flavour. Oh, thanks for your message. The photos have got some problems viewed by IE. I fixed it. It should be no problem right now. is almond flake make the differences? The almond flake only add more flavour and texture. You can omit it if you don't like. As I don't have a cake tin, I'll be using a rather small loaf tin. How long would the baking time be? The baking time depends on the size and the depth of your tin. Instead of grams, do you have measurements in teaspoons/tablespoons and cups? I use gram measurement for baking for it's more reliable for getting the best results.